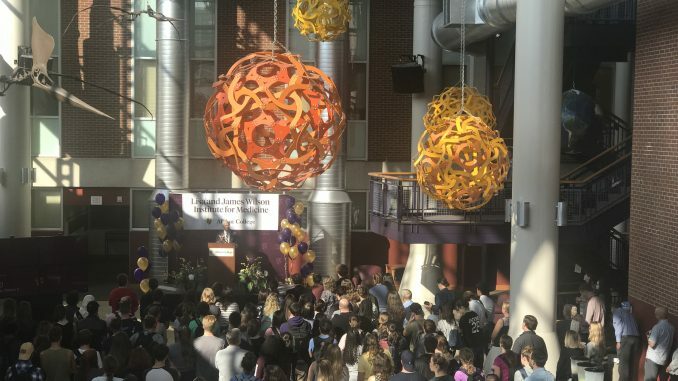 In a celebratory event held at the Norris Center Science Atrium, President Mauri Ditzler announced the creation of the Wilson Institute for Medicine following a $5.1 million gift from Lisa and James Wilson, ’79 and ’77. The grant will transform the Institute for Healthcare Professionals into the Wilson Insitute for Medicine. The updated coursework and requirements will give Albion students a competitive advantage when applying to medical school. The gift will go into effect immediately. The science department promoted a faculty member to assist more students with finding clinical work. Additionally, an MCAT prep course will be offered next semester for juniors and seniors. James here are some excellent students that come to Albion College who will be accepted to medical programs. Then there are students who have dreamed of becoming doctors but are on the border of being accepted to medical school. James’ goal is to ensure those students have a competitive advantage and are able to fulfill their dreams. Ditzler noted that large gifts make many dreams come true. With Wilson’s gift being the single largest gift in Albion history, Ditzler said he is sure the impact will be seen for many generations.